It looks like the surrender by John Boehner on funding Obama's unconstitutional amnesty and Obamacare has fired up a conservative rebellion against "Sobbin" John, and it's about time! Rep. Ted Yoho (R-FL) says he will vote against House Speaker John Boehner’s re-election. Further, Yoho is the first GOP member of the House of Representatives to announce he is willing to stand up as an alternative candidate to Boehner if no other alternatives emerge. Yoho joins Reps. Jim Bridenstine (R-OK) and Thomas Massie (R-KY) in announcing he will not be voting for Boehner on Tuesday. Yoho also said in his statement that he would be willing to stand up as a potential alternative candidate to Boehner, if members feel they need to vote for someone other than Boehner even though the Congressional Research Service report detailing speakership elections says there is no need for an alternative. Technically, Republicans need just 29 GOP votes for someone other than Boehner as Speaker on the first ballot—at which point the vote would be kicked off to a second or third or fourth ballot. 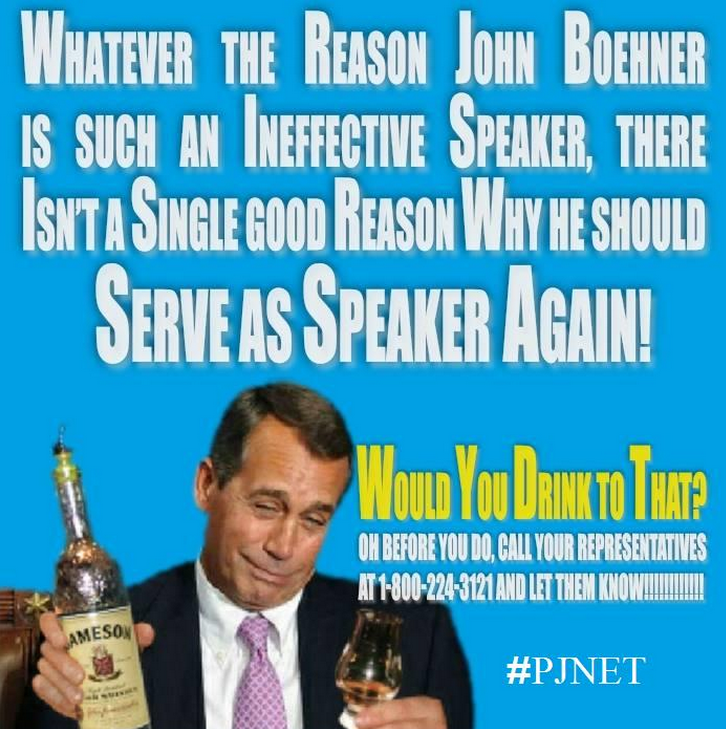 If Boehner is not re-elected swiftly on the first ballot, it is likely that shortly thereafter an alternative would emerge. In a news release, Rep. Bridenstine applauded Yoho’s actions. “Congressman Ted Yoho is a courageous leader. I applaud and respect him for standing up to offer an alternative to the status quo,” the Oklahoma Republican announced. One of my favorites (and a fellow Texan) Rep. Louie Gohmert, has also announced he'll challenge Boehner. “After the November elections gave Republicans control of the Senate, voters made clear they wanted change. There have been numerous examples of problematic Republican leadership, but we were hopeful our leaders got the voters’ message. However, after our Speaker forced through the CRomnibus by passing it with Democratic votes and without time to read it, it seemed clear that we needed new leadership. There had been much discussion. But, until yesterday, no one had stepped up. I applaud my friend Rep. Ted Yoho for putting his name forward as an alternative to the status quo. Ted is a good man for whom I could vote, but I have heard from many supporters and also friends in Congress who have urged me to put forward my name for Speaker as well to increase our chances of change. That is why I am also offering my name as a candidate for Speaker. There is false information being floated that any Republican candidates in addition to the current Speaker will split the vote and give the Speaker's gavel to Congresswoman Pelosi. This is nothing but a scare tactic to keep the current regime in power. 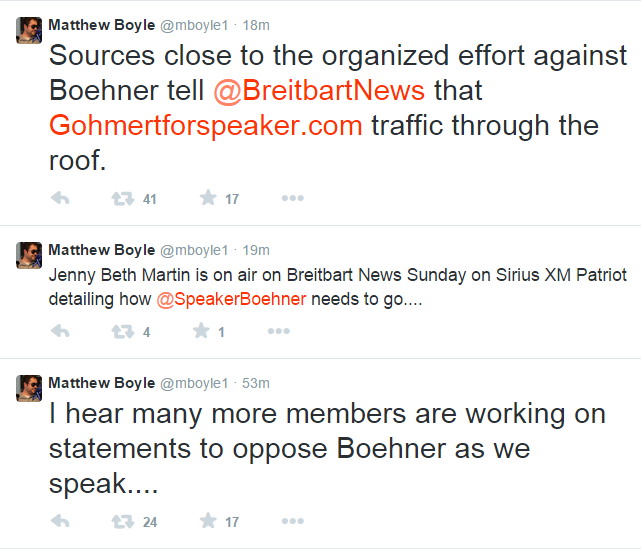 Via FreeRepublic.com, these Twitter posts from Matthew Boyle tell not only how Gohmert for Speaker website has received a ton of traffic, but more defections against Boehner are being prepared. The big vote is Tuesday, and in the meantime, we shall see what happens between now and then. #CharlieHebdo - On Which Side Do You Stand?